The London chapter of the Health Technology Forum (HTF) met for the first time earlier this month and I was fortunate to speak at the event. The HTF is the brainchild of Silicon Valley health tech enthusiast and deal maker, Pronoy Saha, who has created an international network of HTF chapters based in the US, Singapore, India and now the UK. Pronoy hopes that this network of HTF chapters will answer the following question: How can technology be used to narrow the healthcare gap between rich and poor? He believes that by bringing entrepreneurs, technologists, futurists, and clinicians together, answers to this and similar questions will be found in the health tech space. A feature of these meetings is the involvement of clinicians who play a vital role in the adoption of healthcare technologies. My impressive co-speakers were Battenhall founder Drew Benvie, MedCrunch's Ben Heubl, and telehealth expert Charles Lowe. For me the talk of the evening was Drew Benvie's vision of the Quantified Self and how this will apply to digital health in the future. Continuous harvesting of personal data for maintaining personal fitness, disease prediction/avoidance and management of chronic illness is an exciting prospect. Applying these technologies to healthcare will no doubt lead to more personalised treatments during illness. I spoke about how several technologies are being applied to the emergency treatment of heart attacks. These include technologies used during treatment (drug coated coronary stents, a variety of other invasive technologies, genetically engineered monoclonal antibody based drugs and so on) as well as for communication between ambulances (or helicopters) and coronary care units. A recent radio interview where I describe such a case can be heard here. Implantable devices which can be monitored remotely are routinely used in cardiology departments. I also emphasised the role of the UK's National Health Service (NHS) in future digital health. The NHS is uniquely placed to apply new technologies to cost effective, patient centred healthcare. A nationwide healthcare system with comprehensive data capture has the ability to apply new treatments effectively, safely and rapidly to a huge number of patients, as it has done in the treatment of heart attacks. 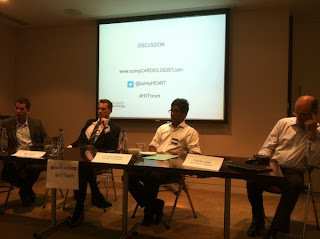 Details regarding the London chapter of HTF are available here. Another review of this meet is available here. The Stenting of George W Bush: Why the Controversy? A coronary artery stenting procedure performed last week on former US President George W Bush has generated controversy. After an abnormal treadmill test (done as part of a routine screening programme), he had a CT coronary angiogram which demonstrated a coronary artery stenosis. He was then transferred to an interventional cardiology centre where a stent was inserted into the coronary artery via the femoral artery. Two physicians (neither a cardiologist) claimed that the stent was unnecessary in the Washington Post. Larry Husten writing in Forbes asked a similar question. Burt Cohen writing for Angioplasty.Org gives a more balanced view. Meanwhile, on Fox News, Professor Marc Siegel struggled to get a stent out of its packaging with his teeth on live TV ('Pull the flap at the back,' I could hear many of us screaming). If nothing else, watch the video for a really good laugh. The simple truth is that it is not possible to make any comment about this case without knowing all the details. And those details are private between the patient and his cardiologist. The debate about routine screening tests is not the focus of this post. Briefly, routine screening treadmill tests in the ABSENCE of symptoms are not recommended in the UK, but they do happen (for example, in athletes). I learnt last week that in France all men aged 65 years are offered an appointment with their cardiologist (which I suspect might lead to a treadmill test; can anyone confirm?). 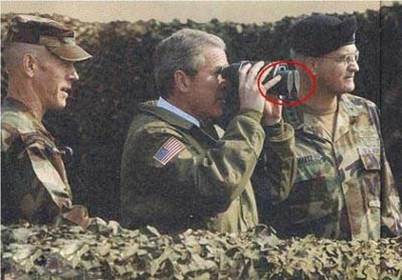 It is entirely possible that Bush said something to trigger concern, despite his excellent level of fitness. In symptomatic patients, treadmill tests are not a 'rule out' test. In other words, a normal result does NOT rule out coronary artery disease. But treadmill tests are cheap, often immediate, and an abnormal result can guide further investigation. In some patients who have no obvious symptoms, a treadmill test can be used to unmask these. The value of treadmill testing (compared to more expensive tests for which patients may wait several weeks) is still being debated. Once the treadmill has been performed, changes on the ECG (or EKG) can indicate ischaemia, in other words reduced blood flow to the heart muscle. Minor ECG changes may have quite reasonably led to a CT angiogram ('I think that this is normal but I want to be sure'). Major ECG changes would have led directly to an invasive angiogram. An anatomically severe narrowing of the coronary artery is likely to have been stented. While 'ad hoc' stenting is frowned upon by some in the elective/stable setting, the interventional cardiologist may already have had evidence of ischaemia. The treadmill test was abnormal. Alternatively the interventional cardiologist may have performed a pressure wire study, measuring what is known as an FFR (fractional flow reserve) across the stenosis. This would have indicated whether the narrowing was functionally important. Much attention is being paid to the COURAGE trial in this debate. This study (published in 2007) recruited 2300 patients between 1999 and 2004. Patients who had a 70% coronary stenosis AND objective ischaemia (<10% in most patients) or angina were randomised to PCI (Percutaneous Coronary Intervention; stenting) or optimal medical therapy (For more on randomised trials, click here). PCI did not provide a mortality benefit over 4.6 years. In this study, less than one third of the patients had significant (>10%) ischaemia and so to me it is not surprising that the study did not demonstrate a benefit. It is probably reasonable to ask why patients with no angina and no significant (>10%) ischaemia were having angiograms in the first place. 38% of patients had had a previous heart attack and 85% of the PCI procedures were elective (planned). This does not reflect current clinical practice in the UK where only 30% of PCI procedures are elective (the remainder are emergency or urgent) and all patients with heart attacks are treated urgently. We know that FFR guided PCI improves clinical outcomes in patients (11% were asymptomatic) from the FAME II trial. We now await the results of the ISCHEMIA trial where patients are being randomised BEFORE angiography. The results of this trial are therefore more likely to reflect current clinical practice. In conclusion, I think that it is impossible (and perhaps even rash) to say that Bush's stenting procedure was unnecessary. Perhaps a more pertinent question should be this. Why was the PCI performed via the femoral artery? In the UK, 60% of PCI is performed via the radial artery. Vinod Achan is an interventional cardiologist and clinical lead for primary angioplasty at the Surrey Heart Attack Centre. Listen to his recent interview on BBC radio regarding the treatment of heart attacks and cardiac arrests.